Adidas has a pretty classic lineup and one of those sneakers that will always be considered a staple of the brand with three stripes is the Superstar. It's a very simple tennis shoe with three stripes on the side and just looks clean and classy. There have been plenty of versions and colorways of this shoe over the years, with the primarily white upper and black stripes being the basic model that you'll always see in stores. It's one of those staples of any sneakerheads closet. Even if you don't wear it every day, you appreciate it for its simplicity. Well, now Adidas is giving you a reason and an occasion to wear these classic kicks. That's right, if you have a date on Valentine's Day and don't know what you're gonna wear, Adidas has you covered on the sneaker front. 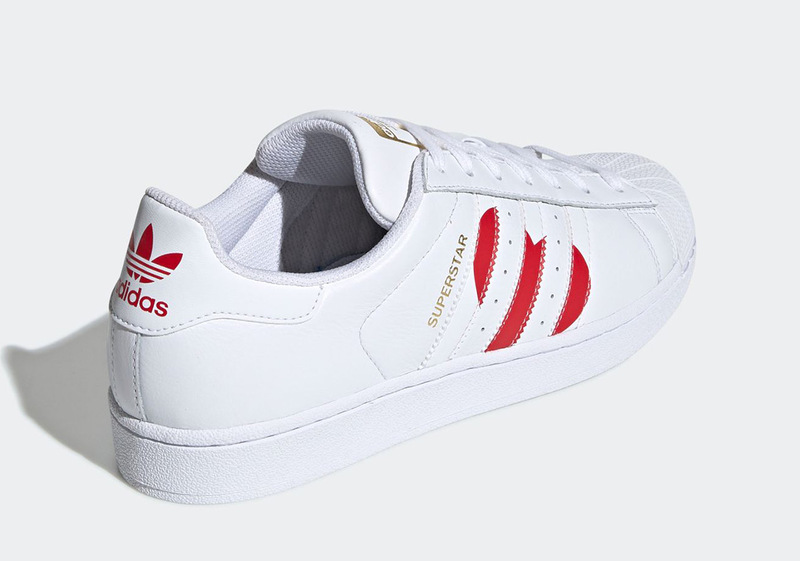 These new Adidas Superstars are wrapped in white leather with a red heart underneath the three stripes on the side. "Superstar" is written in gold just next to the heart, while there is more gold writing and branding on the tongue. As of right now, there is no exact release date for these but expect them to come out just in time for Valentine's Day. There is also no price associated with these just yet, according to Sneaker News.